Aerodrome Management Services Pty Ltd (AMS) was established in May 1996 having operated as a registered business since 1990. The aim was to provide inspection and survey services to what was then a comparatively small client base. Since then our client base has grown substantially and we have diversified and expanded to cater for associated areas. We now provide a ‘one-stop’ service covering all aspects of aerodrome and airport management, from engineering, design, and construction services to inspections, training, and equipment supply. Our Managing Director, Kevin Thomas, has over 30 years of experience in airport operation and management. Before starting AMS he was the Manager – Airports for Wallace Emery and Associates (then owners of Broome Airport) and prior to that the District Airport Inspector with the Department of Aviation. 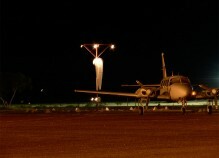 In recent years Aerodrome Management Services has expanded greatly and now employs more than 130 personnel throughout Australia, including aerodrome inspectors, trainers, works managers, compliance auditors, engineers, draftsman, operational advisors, ground handlers, refuellers, security personnel and managers. We work closely with Australian companies, mining operations, local governments/shires, and a number of international airports to deliver professional and cost effective solutions to Australia’s aviation industry.